Let me start by saying that ive been reading posts on these forums for a couple of years. I dont feel comfortable giving my input unless i am 100 percent confident in what im saying. Thus when i do contribute it is genuine and i do so because in a sense we are all in this together, and i feel a sense of obligation to relay my experience hoping that it may help others in the same boat. I decided in october that i was going to have a transplant. My dad had his first of 4 ht’s 10 years ago ( he looks great for his age might i add). My brother had his first of 3 when he was 26. Thus it seemed inevitable that my day would come. Thankfully, at 26, my progression of thinning and recession is much milder than that of my brother and father at comparable age, however my hairline was not something i was happy with. 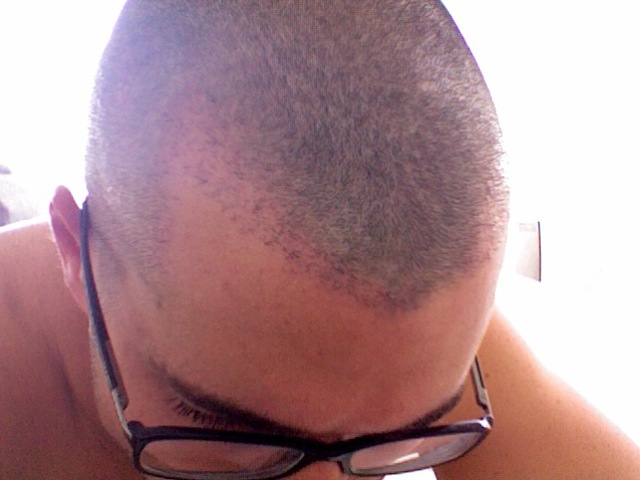 Beyond my hairline i had a dense head of hair, but i felt that my face wasnt framed how i wanted it to be. 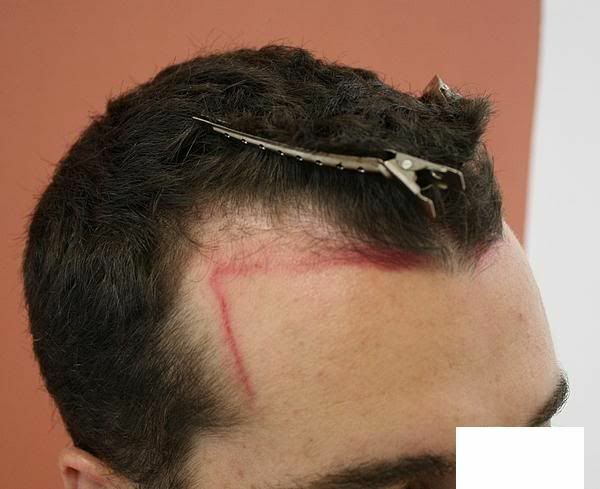 I realize a lot of people in this community are not proponents of creating aggressive hairlines as the wise thing to do seems to be plan for the future. I however dont necessarily prescribe to this notion. I think for some people a conservative approach is more practical and looks better while for others who have more to begin with, i think the desire to create a more youthful look is a matter of personal prerogative. I dont quite understand why some posters get so upset when they see aggressive transplants. I think its incredible that some doctors are able to achieve these results. I can certainly understand the perspective and rational of not building too low, but i can also see why one would want to build a bit lower. Im more of a live in the moment kind of guy. Im still young and quite frankly i want to enjoy my youth to its fullest, plus in my line of work which admittedly is rather superficial, a full head of hair is very important. Lack of wisdom…maybe, but at least ill be naive and handsome I started researching prospective clinics in proximity and after a lot of research i narrowed down my choice to Armani. I was tentatively scheduled to have a procedure done with Dr Sara Armani in December. However in November i was notified that my procedure was cancelled because the pricing structure had changed as the amount i was initially quoted was no longer adequate. Rather dejected i began to mull over my options. There were no other docs in North America that i felt comfortable with. Nothing personal, I think most of the doctors discussed on these forums are phenomenal surgeons, but after numerous conversation and emails things just didnt feel right with any of them. In the end, you want to have one of the best surgeons, but sometimes that isnt enough. I think its equally as important to feel comfortable with your decision, and sometimes you just have to go with your gut. I had never entertained the idea of traveling abroad but at this point i became open to the idea as im a bit of a perfectionist and decided distance would not be an issue if it meant feeling comfortable with my decision. After seeing numerous posted results of Dr Bisangas work i began to consider the option. It is my opinion that his work is consistently excellent and consistently natural. After reading many of your comments on his work, it seems many of you agree. His work showed a wide range of hairlines both liberal and conservative, but all done in an exemplary manner. Upon sending my first email to the clinic i received a response from phil within the hour (he runs the business end of things and works in conjunction with Dr. B). This immediately caught my attention as every other clinic was hardly what i would call timely in their correspondence. Phil is a wealth of knowledge and one of the more patient individuals i have met, which in this business is a breath of fresh air. I had a ton of questions and he took the time to answer every one of them promptly and in depth. I wasnt treated like i was just one of many potential patients…but rather i was treated like i was the only potential patient, which in retrospect is even more commendable after seeing first hand how busy the clinic actually is. It turns out Dr. Bisanga was going to be in south florida (right near where i live) for a couple days so Phil asked if I would like to meet Dr B. face to face for a proper evaluation. I was thrilled that he would offer to take time during his time off to see me. My visit with Dr. B was great. I even got the impression that meeting with me for a consult was part of the motivation for his trip. He asked what i would like to achieve and after listening advised me on perhaps being a bit less aggressive. We spoke at length about it and in the end we compromised on a preliminary design. I felt assured that he could help me achieve what i wanted. Thus instead of shelling out more money for Armani (nothing against them, i think they do great work), i decided to travel to Brussels, get to see a bit of Europe, and get a world class HT from Dr. B (whose work is arguably as good if not better than anyones IMO) all for well less than the price that i would have paid for perhaps any FUE back in the states. BHR charges 4 Euros a graft which depending on the day converts to around 5 dollars. Flight to Brussels are also rather cheap if booked a bit in advance and only abut 7 hours and change. Perhaps most importantly, they stressed the not over harvesting my donor due to risk of transection, and Dr B uses a manual .75 millimeter punch, which later on in the process became more and more important to me. I felt assured that my donor would be left in pristine condition. Deciding to to travel to Brussels wasn’t the easiest decision i have ever made, however after my procedure this past week i am confident that it is one of the best. Granted I am only a few days out but I love the design, and if the yield looks anything like i think it will based upon what i see, an what i have seen from other patients, i will be a very happy young man. Further, im not even a week out and there is already almost zero evidence that anything was taken from the back of my head. Bottom line…Dr. B is the man…hes clearly great at what he does and he couldnt be a nicer guy. The clinic is run beautifully, is immaculate, and the staff is more accommodating than the Ritz, they took care of everything from day one including my hotel stay (which is about a 2 minute walk from the clinic). Even after my surgery, Phil still checks in on me frequently and all my questions about my post op care are answered immediately. Phil is a wealth of information and he loves to share it. (You can see that just from reading his posts on these forums.) Thus, I am writing this simply out of gratitude and further to let those of you in the process of making this very important decision know that while it may require a bit of travel, it is a first class option and in my opinion the best deal in the business. One of the worlds best docs and undoubtedly best staff for the best price. Plus you get a vacation out of it. You just cant beat that. How many grafts did you get? I like Bisanga’s work, you’re gonna look great. The cancellation from Armani is strange and may have been a blessing in disguise. It sounds like you made an informed decison and pulled the trigger. So I hope everything turns out amazing for you. I agree that Dr Bisanga has been posting some impressive FUE results lately. Hoping to see more pics from real patients like yourself in the near future. Yes i believe a blessing in disguise is a fair assessment. I say this not intending any disrespect to other doctors, but rather because it is always a blessing when you end up in the hands of a doctor who you have complete trust and comfort in be it for a hair transplant or something else. As a future physician myself, i believe that the Dr. patient relationship is amongst the most valued, and unfortunately one that is very commonly taken for granted by all sorts of physicians in all fields of medicine. I received round about 2000 grafts, however i feel that this number is somewhat misleading. 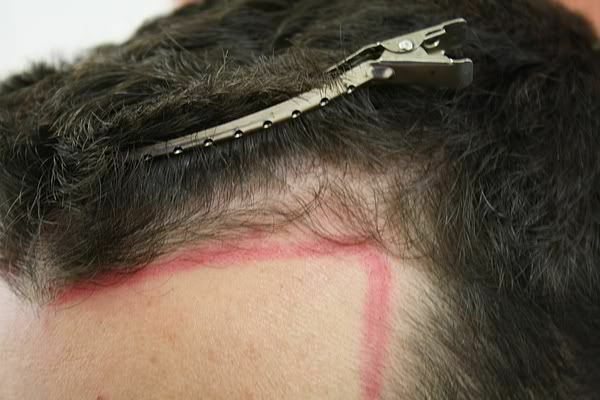 I say this because approximately 1/3 of those grafts were single hair grafts placed very strategically in the hair line in order to create a soft and natural appearance. 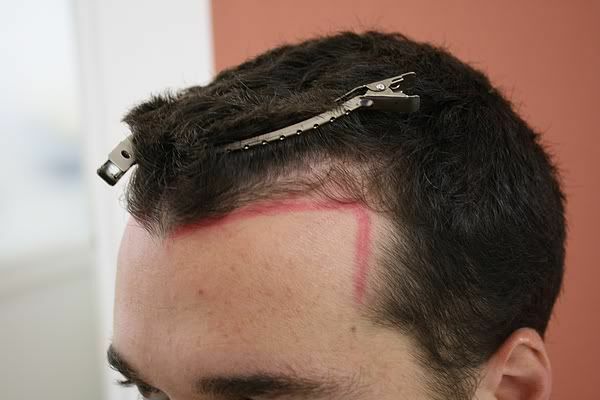 The majority of the rest were two hair grafts placed just behind the hairline in the temple regions. 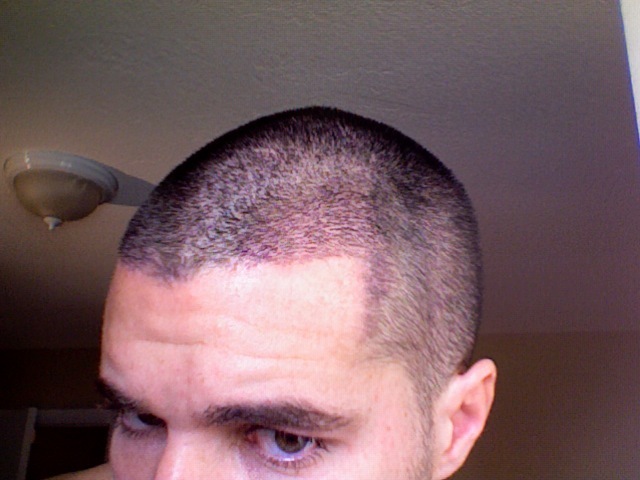 I also had a few grafts placed in the very center of my hairline where i have no recession because of a nasty “cowlick” that creates a rather noticeable parting of my hair directly in the front and center of my hairline. 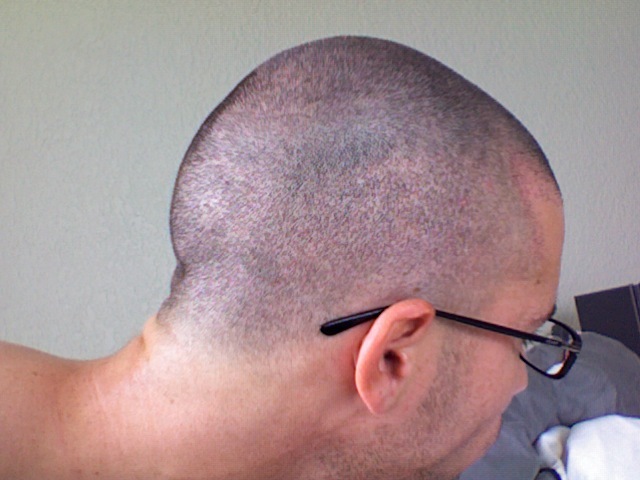 My natural native hair in my donor region is rather thick and my donor density is rather above average. 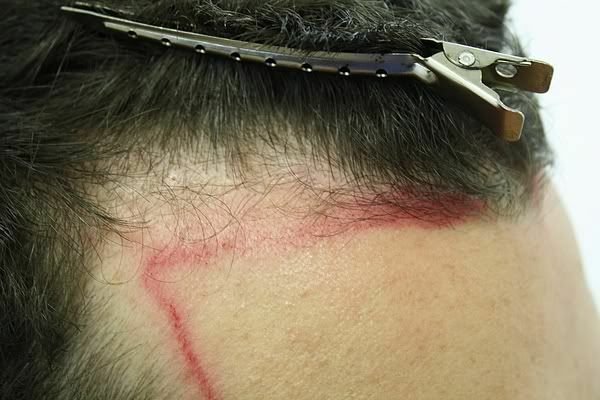 Further, Dr. Bisanga harvested hair not just from the back, but also from the sides of my head, where most of the finer one hair grafts reside. 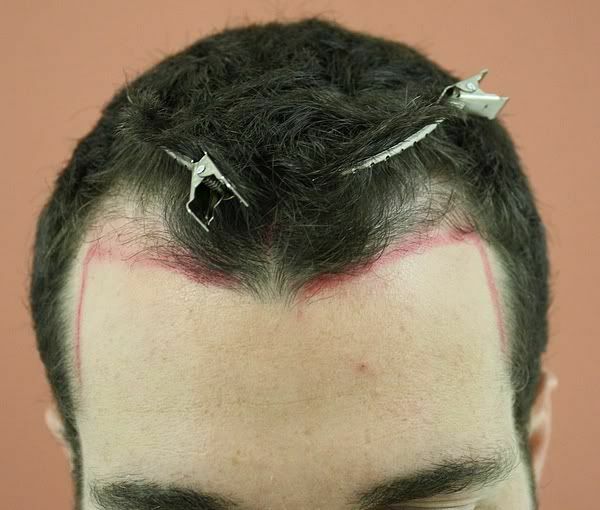 It is my understanding that the grafts on the sides of the head are bit tougher to extract without transection, but a skilled doctor can do so both safely and effectively. Thus when you consider all of these factors, the 2000 grafts have barely put a dent in my donor region. In fact it is now day 6, my hair is just over a millimeter long, and i think it is safe to say that any extraction marks are almost completely undetectable. As a result Dr. Bisanga was able to place the grafts both densely and wisely, while allowing me approximately 4000 more fUE grafts for the future if need be before my FUE donor becomes tapped out. 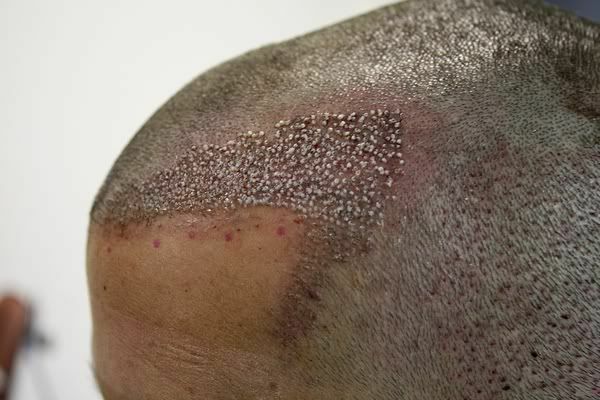 The scabs (or whatever it is) look kind of disturbing to me, I have seen photos from other people just after their surgery how come they don’t look quite the same as your photos? No offence of course, good luck healing. » quite the same as your photos? No offence of course, good luck healing. None taken. Its a fair question. To the best of my knowledge, the white spot around each transplanted graft is the sub dermis skin in which the root of the hair exists. It is extracted with the punch and then dissected under a microscope. 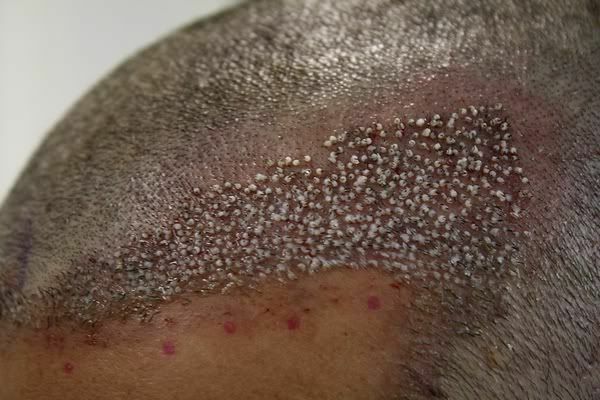 When the graft is implanted, a small portion of this sub dermal skin is often left above the scalps surface. 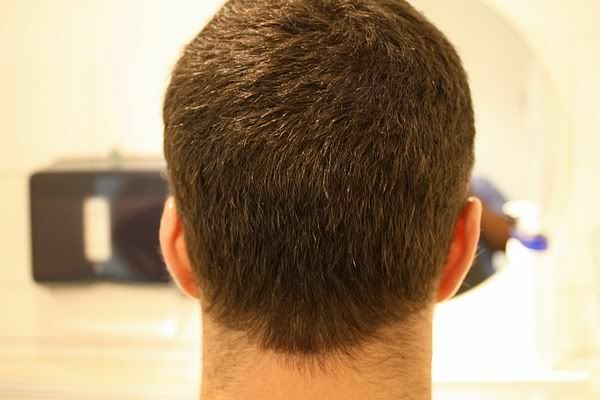 The root is implanted below which in time is what allows the transplanted hair to grow. In my pics in particular, you are seeing the grafts at a very high resolution just after they have been saturated with a saline spray. 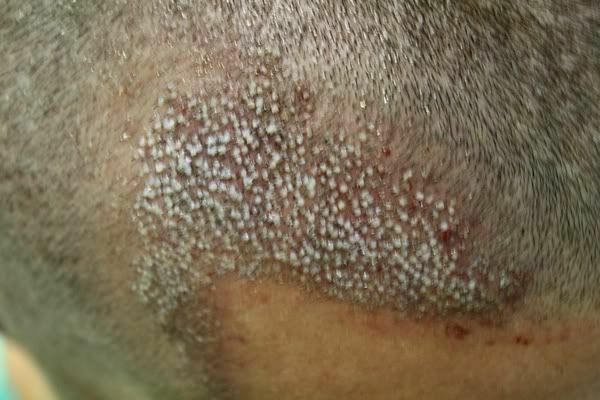 The spray has many purposes some of which are to keep the grafts clean and free of infection. It is also effective at removing blood from the grafts very briefly during and just post op in order to allow better visibility of the recipient area. When the recipient area dries. The grafts look much different as it begins to harden. This process only takes a matter of minutes. That is my understanding. Thank you for inquiring. » others in the same boat. » comparable age, however my hairline was not something i was happy with. » wasnt framed how i wanted it to be. » scheduled to have a procedure done with Dr Sara Armani in December. » other clinic was hardly what i would call timely in their correspondence. » busy the clinic actually is. » 4 Euros a graft which depending on the day converts to around 5 dollars. » zero evidence that anything was taken from the back of my head. » immediately. Phil is a wealth of information and he loves to share it. » just cant beat that. i think the same as mj2003, bhr will not let you down. Any updates to show, how’s the healing going. » show, how’s the healing going. Hope you are well, all the best to you. Thanks for your indepth post. Im sure it will help others in the future. Look forward to seeing the pics. Any updates Raines? How’s the redness? How are you healing? Sorry for the short delay in posting. I am at a bit over 3 weeks out at this point. 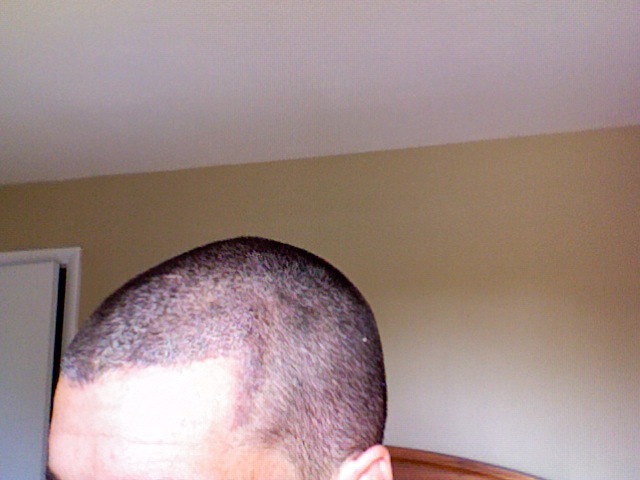 I would say that 90 percent of the transplanted hair has fallen out at this point and my scalp remains just a bit red. However it is getting better as of late. 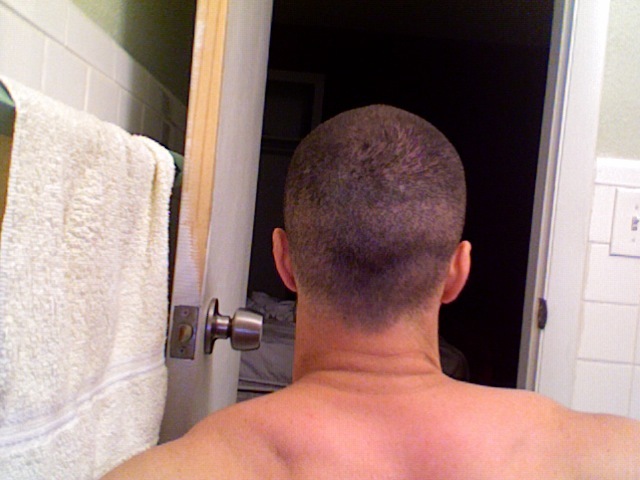 Because of the loss of transplanted hair, i found that growing my hair out made me look kind of odd at this juncture, so i have opted to shave it all off using a clipper but no clip. Thus my donor area is completely out there and unhidden. I will say this, at 3 weeks post op, not one person has said anything to me. 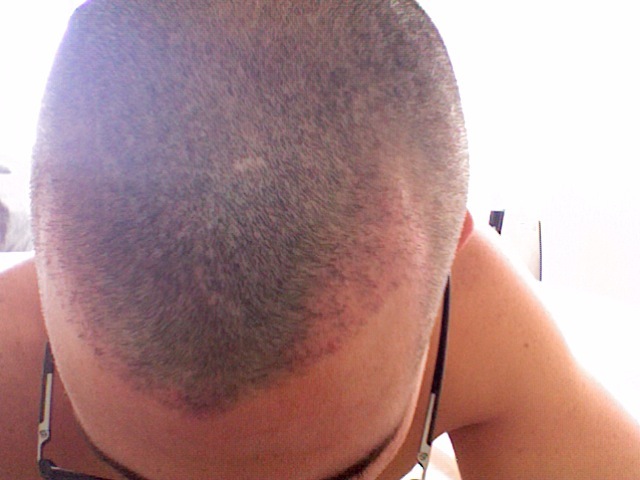 If i dont remember to look for microscopic marks on the back of my head i dont notice anything either. However if you look close enough and you know what you are looking for you will be able to see the smallest of spots, but i firmly believe that to the lay person this is completely unnoticeable. I am attaching some pics from one week post op as well as current. Again i am very sorry for the lack of quality. I know people on this forum want clarity but i am working with what i have. I am still beyond happy with my decision and i wouldnt change a thing. As always i will be happy to address any further questions. Thanks for the update. 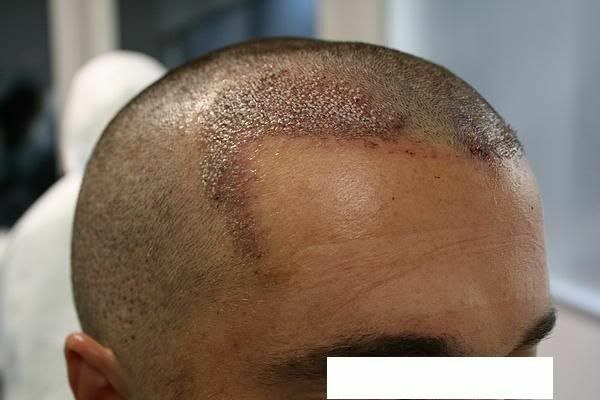 You look to be healing nicely. I think that’s going to look rather good when it grows out. Congrats! Learn to use paragraphs. I read about the first 10 sentences and then quit. Oh im sorry grammar police. Next time when i post on here just for you ill be sure to keep that in mind...until then....learn how to develop people skills...i read your first then words and then quit. Heres where id start a new paragraph if i cared. In all seriousness…im just playing, i mean no harm, but you kinda had that coming. Hey Raines what’s up buddy, Thanks for sharing your story, Im very interested in Dr Bisanga. Do you have a personal email where i contact you? Thanks alot.